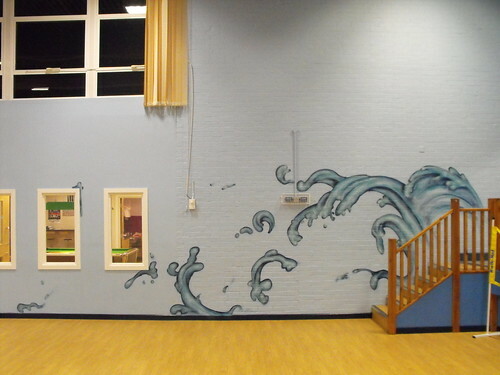 In November 2009 Arkade Graphics were asked to produce paintings inside the main hall of the youth center .Using blue to match the interior of the building a wave was painted moving down a set of stairs on the west wall . 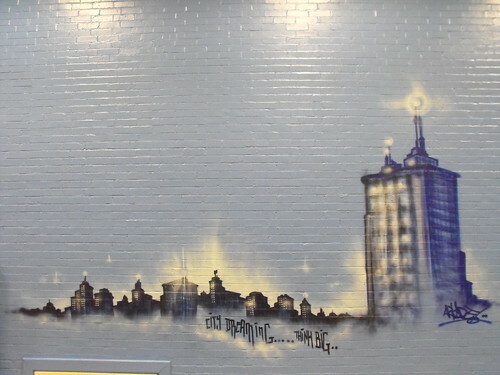 A city scape view was also painted using blues on the north wall , these images were collectively decided upon to try to encourage the young people to look at the bigger picture in life, and the wider world around them. The young people who attend the youth center expressed their love for the new artworks saying “it now feels more like a place we would wish to spend our time” . This entry was posted in Artwork, Commissions and tagged Arkade, arkade graphics, arkadegraphics, arlesey, arlesey youth center, cityscape painting. Bookmark the permalink.